I love this rug. 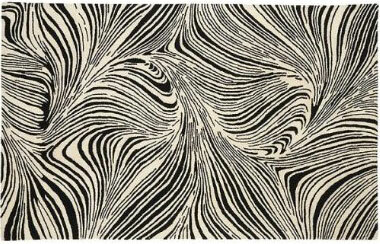 The print is referred to as zebra, but I think of it more as swirled paint. It's from Target, so it's affordable, and appears to be completely sold out right now. I hope they do this design in more colorways, I'd love to see it as a subtle tone-on-tone version. According to random.org, the lucky winner of the gray rose earrings is commenter #13.... Bekah Rankin! Bekah, I've contacted you to get your address so I can send these out to you. Congrats!